If you’re looking for a Lobster Fra Diavolo recipe fit for a Christmas Eve feast, this one should do the trick. I love that, for many Europeans and Italian-Americans, La Vigilia (The Vigil) is celebrated with a seafood extravaganza. While the origins of this feast are religious – from the practice of abstaining from meat on holy days to the symbolic significance of the number of fish served (some families serve seven to represent the seven sacraments of the Catholic Church while others serve up to 13 for the twelve Apostles plus Jesus) – it has become engrained in popular culture through the years, especially by Italian-Americans who refer to it as ‘The Feast of the Seven Fishes’ (Festa dei sette pesci). 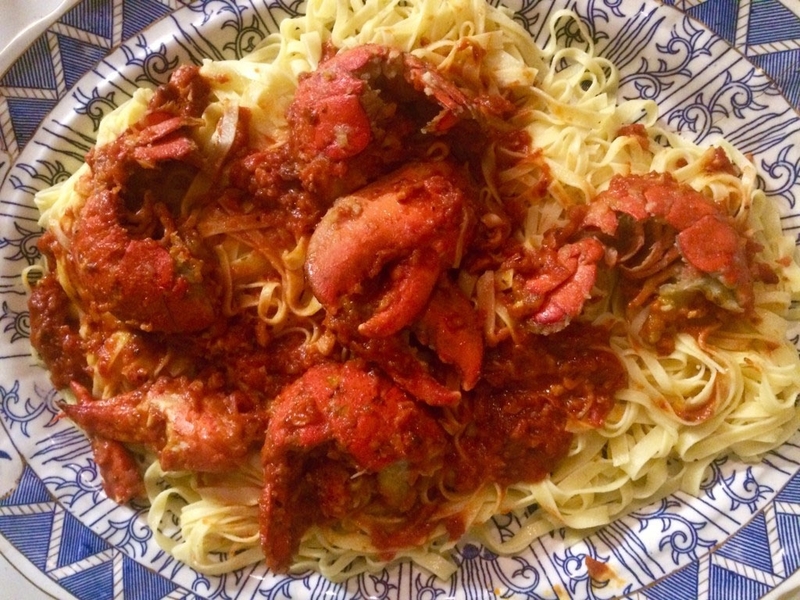 And Lobster Fra Diavolo – lobster with pasta in spicy tomato sauce – is one of the most popular lobster dishes referenced in the context of The Vigil. My husband is of Italian origin (with Oragano as a last name, how could he not be) and loves to cook. This year he’s been experimenting with Lobster Fra Diavolo recipes in the lead up to Christmas Eve. We’ve had fun sourcing ingredients and selecting complimentary wines from our local Italian delicatessen along the away. Below is our recommendation for a quick, easy and delicious Lobster Fra Diavolo recipe to serve this Christmas Eve. It is an adaptation of a Saveur Magazine spicy lobster pasta recipe and it packs a firy punch. 100% Delizioso! Two whole lobsters (around 1 and 1/2 pounds). You can buy live lobsters and kill them yourself before cooking or have your fishmonger kill them for you. 5 cloves garlic, chopped medium to fine (I rarely take the time to chop them finely)! Kill the lobsters (if not already dead) and remove the claws and tails from the body. Crack the claws open, keeping the meat in the claws. Cut the tails in half lengthwise, keeping the meat in the tail. Then toss all the lobster pieces, including the bodies, in flour. Heat the oil in an large cast-iron pot over a medium-to-high heat. Shake the excess flour off the lobster pieces and add them to the pot, cooking 6-to-7 minutes until the shells turn red. Then transfer the lobster pieces to a bowl and set aside (note: if you work from previously cooked lobster, as we did, you only need to cook the lobster for 3-4 minutes, until the oil has coated all the flour). Add the chile flakes, oregano, and garlic to the cast-iron pot and cook 2-3 minutes then add the tomato paste and cook for a further 2 minutes, stiring constantly. Pour in the cognac and cook it until it is almost evaporated. Add the stock, canned tomatoes and bay leaf and bring to a boil. Reduce the heat to a medium-low and cook, partially covered for about 25 minutes, until the sauce gets reasonably thick (Note: I cooked my sauce for about 30 minutes and felt the final sauce was a bit too dry). Return the lobster claws and tails to the sauce and continue cooking until the lobster is thoroughly cooked, about 10 more minutes. While the lobster is cooking, boil a pot of water and cook your pasta. Once the lobster is cooked, season the dish with salt and pepper. Add the pasta and toss with the sauce then transfer to a large serving platter. It’s a messy dish so serve with pleanty of napkins. While most red wines do not go well with lobster because the tannins in red wine do not react well with the iodine found in lobster, Lobster Fra Diavolo is one dish were you can get away with serving red. A good red wine to pair with Lobster Fra Diavolo is Sangiovese because it has enough acidty to match the acidity of the tomato. A light Valpolicella or Bardolino are options to consider. If you like bubbles, I recommend serving Lobster Fra Diavolo with rose Champagne which works even better than regular champagne with spicy heat. If you’d like to see more lobster wine pairing recommendations, click here.